The weather here in lovely Des Moines Iowa is crap and has been for 7 weeks now. I have ran outside 3 times since Thanksgiving and the rest has been on the dreadmill. Now don't get me wrong I am thankful for my running machine. It was a gift from my father and he drove it up here for us last winter. I can't imagine life without it now but as I look out the window and see the sagging trees covered in a thick layer of ice I long for sun and a day to breathe the fresh air. I love to run. I love to run outside. I even like to run in the rain or mud and can run in the cold if I must but the conditions of this winter have been down right treacherous. Ice and snow and many days of single digit or below zero days. 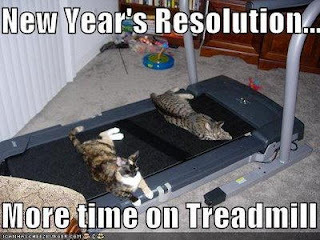 I don't want to darken anyones day with a rant I so decided to look at the bright side and post an ode to treadmills. The first place to start of course is youtube. I am not a fan of the so called funny videos where someone gets hurt and humiliated and we are all supposed to laugh but this guy.....this guy meant to do it and he gets back up dancing! The point and purpose of a treadmill for me is to maintain the fitness I have and to try and keep my feet conditioned during the months when I am stuck inside. Unfortunately I have more problems being a barefoot runner on a treadmill than I had running on roads last summer and fall but thats another issue. Some people though require fancy shmancy. 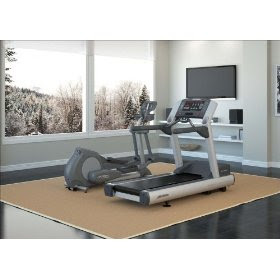 Its a nice set up indeed but I don't think the view and the entertainment center comes with the $5,699 that the treadmill costs and when it comes right down to the bottom line, you will still be running in place on a machine. It would be nice I must admit though to program inclines instead of manually lifting and lowering the back of the treadmill to choose between flat, medium and hill incline but really as long as it tracks miles and time, I am happy. Speaking of happy, these guys make me smile OK GO. 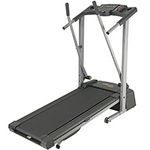 Treadmills come in many shapes and sizes. 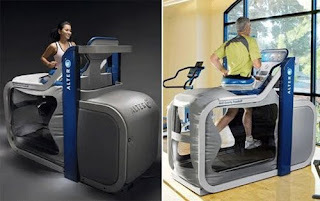 You can run on a NASA zero G treadmill that looks like a giant inflatable shoe. 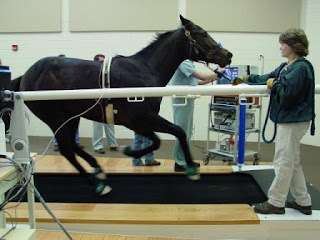 Horses and dogs run on treadmills. Cats are too cool for exercise. 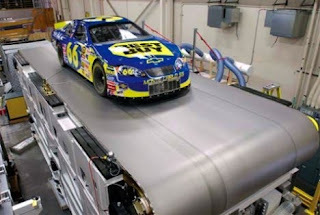 Cars run, or drive on treadmills. 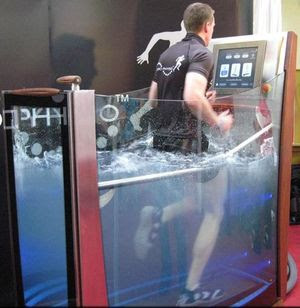 If one so chooses, you could run on an underwater treadmill. 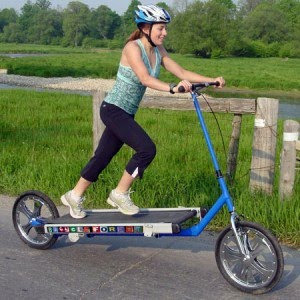 And if you can't decide if you want to run or ride your bike then just do both! We all try and cope with the winter in our own ways. 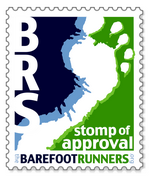 Some take a break, some cross train and go to the gym others like some crazy barefooters I know run outside regardless of the conditions. For me I run in my basement and imagine running on the beach or in the mountains or just on my favorite route here in Des Moines. I imagine the races that I will run in the coming season. 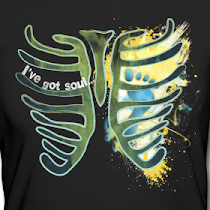 Most of all I meditate and breathe and work on being calm in the face of physical strain. Its good practice. I learned from last year that even when I feel hostile to the idea of getting on that crazy contraption I need to do so for mental and emotional maintenance. I need to burn up some energy so I can manage stress and it makes me a better wife and mother in general as well as a better runner. Here is a video that cracks me up every time. The guy keeps up which is impressive but most of all the laughter of the cameraman is contagious! Happy running all and here's to dreams of spring! Leave it to the Japanese to take something as benign as running on a treadmill and, well - you got the idea.